A dynamic, real-time collision detection system that enhances the safety of stockpile operations. Avoid costly damage to infrastructure, reduce downtime and effectively manage stockpiled material. 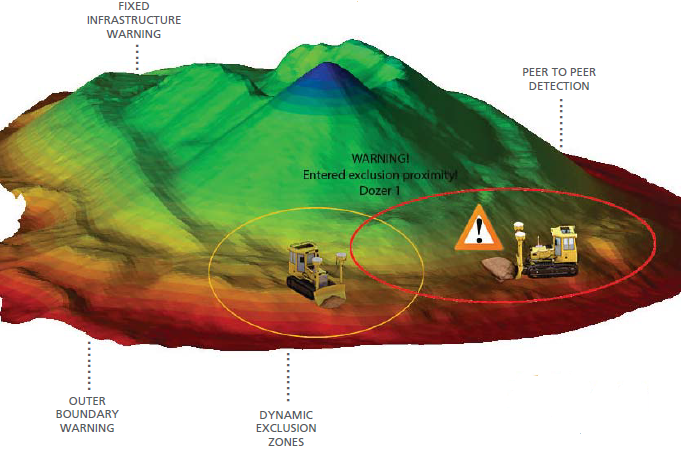 Employing smart & dynamic geo-reference boundaries surrounding both mobile plant, fixed infrastructure or hazardous areas, collisions are avoided. A streamlined workflow allowing integration with over 40 file types, including ESRI Shape files and Digital Terrain Models draped with Raster images, which can be added to simulate current terrain conditions. Integrated software come pre-loaded on a Trimble 12.1″ rugged android tablet that provides 4 levels of collision detection. Combined with two advanced 220 channel Trimble GNSS receivers supporting multiple constellations including Beidou and QZSS for performance positioning around infrastructure. In addition the GNSS receivers also leverage Trimble Proprietary xFill RTK augmentation. SNS SiTRACK is fully compatible with any wireless system onsite, or SITECH Solutions can design and install a Rajant Wireless mesh system for the fastest data transfer rate available in the market. SNS SiTRACK can also operate in Cab without the need for a Wi-Fi system provided it can achieve high precision through a local GNSS correction signal.